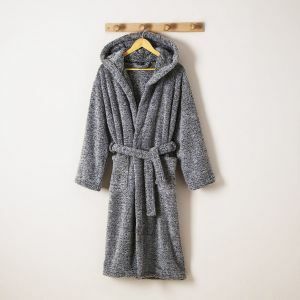 The bathrobe for men and women Instant is velvet jacquard 520g / m², gray color with a white herringbone pattern. 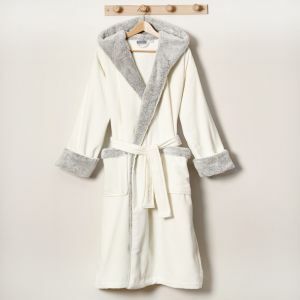 Its very thick and soft material make it a warm and very comfortable bathrobe. This velvet bathrobe has a large, elegant shawl collar and two large patch pockets on the front. It can be fastened with a belt held by two loops at the waist. It hangs easily thanks to a sewn loop at the collar. This bathrobe is available in 5 sizes from S to XXL. 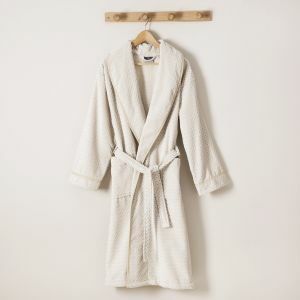 Jacquard velvet bathrobe 520g / m2, for men and women.